Spoon-billed sandpiper (Calidris pygmaea, hereafter “SBS”) is one of the most endangered species in the world. As a long-distance migrant, the protection of key stopover sites along its migratory route is critically important. 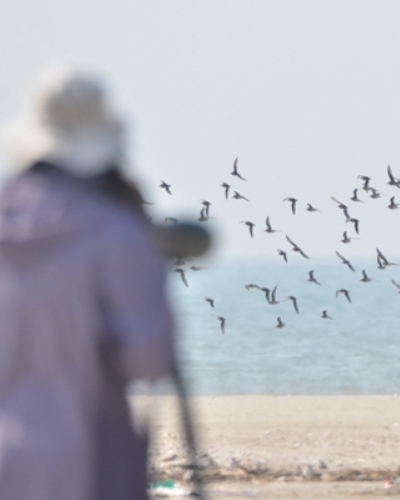 Situated in Southwest Guangdong province, China, coastal area in Leizhou Peninsula is known to support a considerable number of wintering SBSs, up to 4% to 8.6% of the estimated world population in 2016. However, factors like habitat loss, illegal poaching and other anthropogenic effects have been threatening its population and habitats. Nevertheless, basic knowledge of their wintering ecology in this area is still insufficient, and thus a complete survey cannot only help us to collect the information of population and habitats, but also analyze its in situ conservation status. Therefore, we propose this application in order to (1) Improve knowledge of wintering distribution, population number and ecology of the SBS in Leizhou Peninsula. (2) Evaluate the conservation status and potential risks for SBSs in Leizhou Peninsula, which will help to design targeted conservation plans in the near future. (3) Raise conservation awareness of local communities, aiming to emphasize the importance of SBS conservation in Leizhou Peninsula.